Does your Dad love a good bottle of wine? Then he'll certainly get a kick out of receiving this adorable Father's Day wrapped package! It's a fun and festive way to decorate wine bottles with wrapping paper and an awesome Bowdabra Bow Tie. 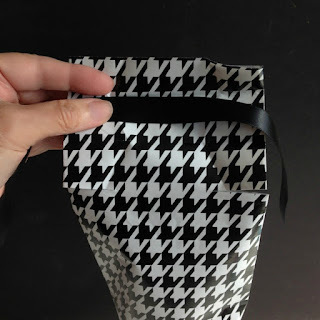 This post first appeared on Bowdabrablog where I'm part of the design team. Begin by cutting the wrapping paper large enough to wrap around the wine bottle, leaving a few inches on the bottom to close and on top to fold down into a collar. Apply double sided tape along the edge of the wrapping paper and then wrapping the paper around bottle to seal. Fold in the bottom paper, applying double sided tape to center. Crease and smooth outside edges the length of the bottle neck. Make a 1/2" fold at the top . 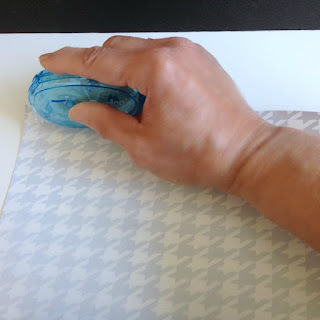 . .
Next, just at the edge of the fold, make a 1/2" horizontal cut from the outside edge on the right and another on the left through the paper and not the folded portion. Make a vertical fold on both left and right sides into a "V" for the collar. Unfold the collar and place a strip of ribbon on the fold line and fold over again with ribbon - as if tying a bow. Crossover the ribbon tails just under the collar . . .
and secure with a dab of double sided tape. Cut off excess ribbon close to collar. Cut a 12" piece of Bowdabra bow wire and fold in half. You will have a loop at one end and two loose pieces at the other end. Place folded wire into the Mini Bowdabra. 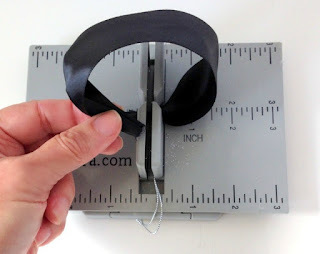 Cut a 7" piece of ribbon, crease end and insert into the Mini Bowdabra. Crease the other end of ribbon and loop above the tower and insert into the Mini Bowdabra. Each end is gathered and centered in the Mini Bowdabra. Using the bow tool and ruler as a guide, position the loops evenly. 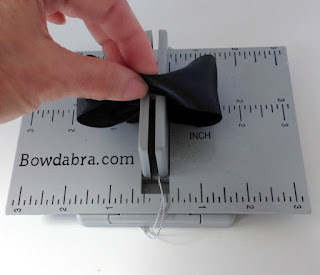 Pinch the side of the ribbon and press center down into the Mini Bowdabra. Scrunch down ribbon with the Mini Bowdabra wand. While the bow is still in the Mini Bowdabra, thread the two loose ends of the Mini Bowdabra bow wire through the loop at the other end, pulling the wire tightly. Gently pull the bow out, separating the two loose ends around to the back, tying in a knot. Cut off excess wire. To finish the bow, cut a small piece of finishing ribbon 2" long. Run double sided tape along the wire and attach the finishing ribbon, starting and ending at the back, heat sealing ends. Fluff bow. Adhere Bowdabra bow tie to center of wrapping paper collar with glue. A super cute, fun and festive Father's Day gift wrapped bottle of wine! My dear Gail, what a darling wrapping idea! I hope you are well and enjoying this month of June. Hugs! so adorably super cute and what an awesome gift idea! Gail, how clever! You always come up with the cutest ideas. Hi Gail! This is such a cute idea. How's your almost Summer going? Mine is off with a bang and I'm staying busy. Hm, I thought summer was supposed to be lazy? Have a good week! Great project and perfect for the men in our lives. Love the idea of a shirt with a bowtie. Clever once again Gail. What a cute, fun way to present a bottle of wine. Love the paper you used with the bowtie. So, so cute.